Just walk to the edge. I’ve been lost as a child. It was in an Iowa cornfield. You know, you’re young, you’re playing around with your cousins, running and hiding and yelling, and then, suddenly, you are completely lost. Green stalks block your vision in every direction. Is that the decaying remains of an old cornstalk, or is that a child-eating snake? Of course it is a snake, and of course you look like a Tasty Tater from Tasty Tacos. One more statistic in the declining rural population. I’ve been lost as an adult. It was driving to crime scenes as a prosecutor. There was no such thing as a cell phone in those days. I’d find a phone booth somewhere on Ingersoll or Hickman or wherever and call police dispatch. It wasn’t a stretch to imagine the conversation after I hung up. “It’s Weeg again. Lost. He’s at that phone booth on Ingersoll. I don’t know how he’s going to write a search warrant when he can’t even find the crime scene. He’s a dope.” And then a little while later, I’d call from a phone booth on Douglas Avenue, still lost. I was always thankful my wife, who whole-heartedly agreed with the dispatchers’ assessment of my abilities, was home asleep. Lord, Des Moines is 12 hours away by plane. I am lost. My wife is lost. Our GPS on the phone is lost. And the water is rising. So much so, they’re selling plastic-bag booties to walk across St. Mark’s Square. We stumble out of a dark alley and see a well-dressed man in the middle of the street, hands outstretched, large smile, ushering us into his restaurant. He pulls the chair out for my wife, he smooths the tablecloth, he helps with the coats. He stands at attention in his white-pressed shirt and tightly tied half-apron. Waiting for us to settle. Then his hands take flight to explain the Italian-only menu and life in general. 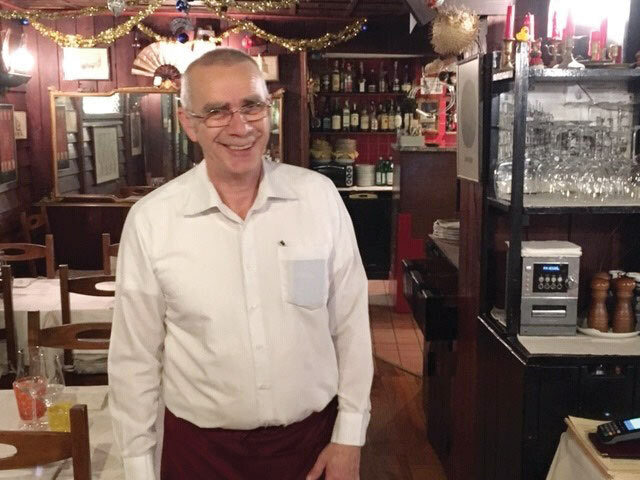 Dario has been a server for 46 years. This is his profession and his love. And Dario smiles, steps to my right. Pours the wine. Wipes the side of the bottle with a white cloth. And with a small flourish, ties the cloth around the bottle. Dario shakes his head, befuddled at the notion of a microwave for anything. Dario, you are not a young man, where does this all end? Dario, before we go, I must admit that we are lost. How do we get home? So we do. 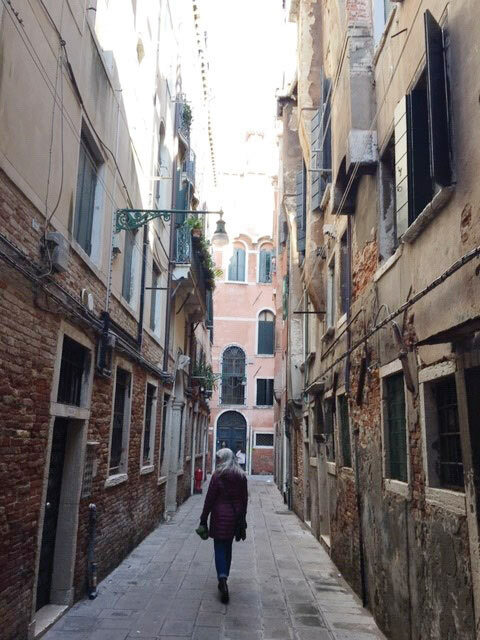 Until we are again lost in the narrow alleyways. “The Jews must all live together in the Corte de Case, which are in the Ghetto near San Girolamo; and in order to prevent their roaming about at night: let there be built two Gates. . . and [they] shall be closed at midnight by four Christian guards appointed and paid by the Jews.” – Riccardo Calimani, The Ghetto of Venice. Yup, not only were the Jews imprisoned, but they had to pay for the guards. Unbelievable. Now we are both lost, and sad. We stumble out of the Ghetto and wander for blocks until we come across Giorgio. A complete change of tune. 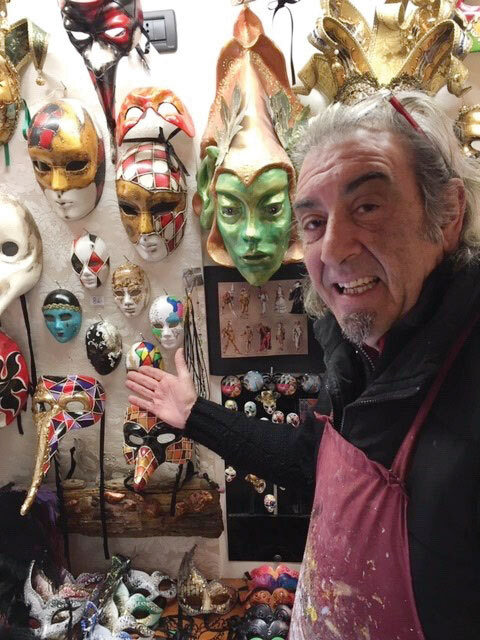 Giorgio Galasso works in a tiny shop down a narrow street as a mask-maker. And Giorgio found those people and became a master mask-maker. He now teaches mask-making workshops around Italy and elsewhere. Although, with his malleable face and striking features, it is tempting to think Giorgio might have become one of his creations, like dog owners become their dogs. Good to know. But, Giorgio, with all your experience of Venice, how do we get unlost? Sure enough, Giorgio is right. There’s the edge. Joe Weeg spent 31 years bumping around this town as a prosecutor for the Polk County Attorney’s Office. Now retired, he writes about the frequently overlooked people, places and events in Des Moines on his blog: www.joesneighborhood.com.